IT has an unprecedented opportunity to deliver strategic value & modernize enterprise-wide services. #TransformITReinvent the Role of ITIT is well positioned to drive change across the enterprise. How can IT become more biz-strategic? Q5) Is email the culprit in preventing companies from getting their internal services automated? A5: Yes but no. DON'T eliminate email as a knee-jerk reaction! Use it more wisely. Q5 - IMO no... it is a good patsy but our ability to collaborate with Business is getting in the wat of automating. What I actually value about email (NOT for service requests) is its "on the record" nature. A5 Email is just a symptom of people following the herd, give them something that provides insight and transparency and delivers the outcome and they will use it...when was the last time you cared how amazon gets you books! They say email is the killer app, and it is/has been, but we need to not have to rely on it as much as we have been. Specifically, what are options? Q5: I think email requests is the same as those 'hallway hijack' requests - why do people resort to it? It's quick, easy and I get to pick my favorite tech to help me out. A5 Yes. Let's face it. What is the first thing people do when they get into work in the morning - Check Email. That is the primary place where people outside of IT (and sadly some inside) receive requests and resolve them. Eliminating email as a reaction to its abuse for service requests would be like eliminating hallway convos. I don't think people want to get rid of the human side of email, they just want to make service requests as efficient as possible. Email is half duplex communication replied to most often on a LIFO basis. Today's businesses demand real time full duplex communications that support and enable the outcomes they seek. A5: Email is not a roadblock, it is one enabler among others (app, phone, forms, face to face discussion), through an omni-channel way to execute tasks supporting business processes. Q2) Why are business services within a company behind in terms of automation compared to the services we access in our personal lives? the average age of an enterprise application is 19 years! A2: Economies of scale, of course, plus market drivers: hundreds of millions of consumers for personal svcs. Generally, when a company invests in IT, they expect it to stay in use as long as practiceable; they don't want to replace anything if it works just okay. challenge has been thought leadership around Enterprise Service Management which is rapidly emerging with real case studies and user stories. I agree with @sitare21. We hear a lot of that within our organization. 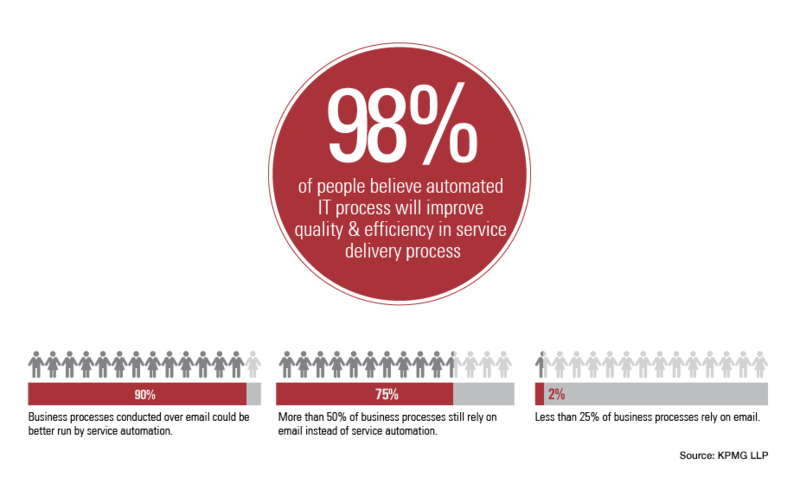 People are also uneasy of going through what they perceive to be a complex migration to automation. Enterprise tech typically cuts corners on UX, beta-testers, feedback loops involving end-users, and other elements common to the commercial appdev space. These take their toll in usability and user adoption. @dvellante Wowsie, Dave. I suspected long times but had no idea 19 years! Q6) What role does cloud computing and enterprise service management play? How do you define that? A6: Ideally, the cloud simply facilitates ease of implementation. Just a means to the end. I consider cloud computing to be a part of ESM. ESM is the superset. Biz service automation and cloud services are inextricably entwined. The more cloud services we subscribe to, the more business automation goes along with them. IT teams are used to managing #SaaS, so there's a growing mindset that says, we manage services. Depending upon enterprise requirements, more knowledge workers can become data managers. Great asset of automated ESM. Q3) How do you think #Millennial employees are impacting this trend? A3: IMO that's overstated. The world is evolving towards higher expectations, not just Millenials. The non-Millennial execs I deal with are as impatient about constraints as any 20-something. I don't think Millennials see such a strict work/life distinction as past generations have. For them, work is happening all the time, and should be as easy to access as apps on their phone. They had easier, better, more productive collaboration tools (basecamp, github, gdrive, etc.) as indebted college students than they do at multi-bln enterprises; refuse to accept "it's just the way it's always been"
A3 yes, definitely. Technology is what they know and what they are comfortable with. @PeterKretzman Great point. #GenY may have pushed the envelope, but previous gens are adopting as well. @PeterKretzman I agree that the curve by which we grade technology experiences has been sliding higher and higher both outside and inside the office. Millennial simply have a lower tolerance than other gens. A3: New generations have been raised in a GAFA model (Google Amazon, Facebook and Apple). They expect, no, they require a similar experience, or they will shop somewhere else. Of course they influence, their own business environment.